This was truly a first for me. Despite having been flying to and within Russia very often in the last few years and even participated in a professional project that involved this airline, I had never had the chance to fly S7 Airlines. Their new direct flight between Barcelona and Moscow Domodedovo, that strikes the right balance between a decent schedule (it departs for Moscow shortly after midday) and competitive pricing looked like the perfect opportunity to finally experience what this private Russian airline has to offer and write the subsequent flight report. I would like to start this S7 flight review with a few words about the aircraft. S7 (and its subsidiary Globus, that operates with a separate AOC, but uses the same brand and distribution channels) operates a mixed fleet of Boeing 737-800 and Airbus A320 aircraft (plus some Embraer's E-170s that are mostly based in Novosibirsk). S7 is also the launch customer in Russia for both the Boeing 737 MAX (9 aircraft ordered) and Airbus A320neo (18 A320neo ordered, 4 already delivered and in service, plus another 3 A321neos). No A320neo for this flight, though (apparently they are deployed mostly on Asian routes from Siberia). 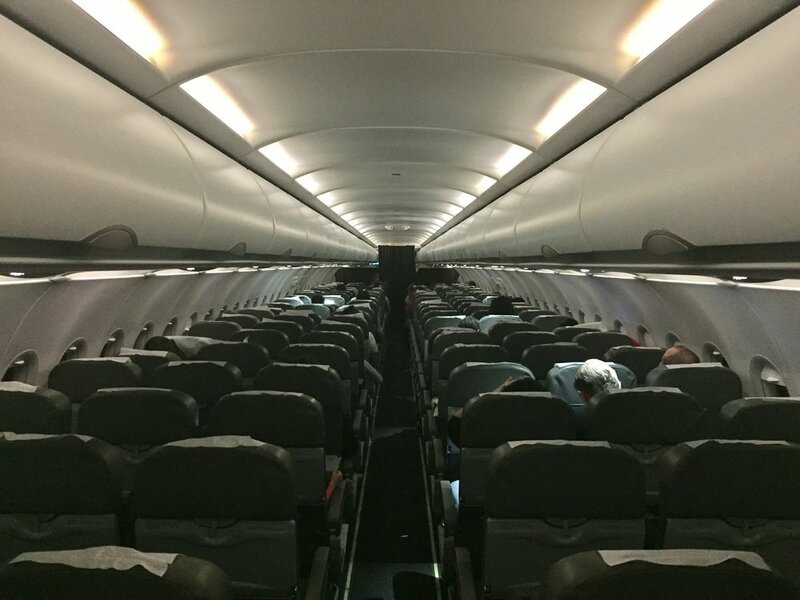 This flight was to be on a "normal" A320-200 aircraft. S7 uses a two-class configuration on its A320s, with 8 business and 150 economy class seats. The first rows of the economy class cabin are "premium seats", providing some extra space, that you can book for an extra fee. In a country that still registers a relatively low (although growing) percentage of online bookings, S7 have long been a referent when it comes to usability and user experience on its digital channels. This digital expertise shines throughout the booking process and, again, shortly before the flight when doing the online check in. Compared with its (larger) main Russian competitor, Aeroflot, the whole process was smooth as silk. S7 operates a pricing structures based on 4 branded fares, two for economy and two for business (below). My own experience is that the price difference (around €20 or US$25) between the most basic fare and the flexible fare (that allows check-in luggage and flight changes) was low enough to make this, indeed, the best fare. The chasm between these and business class is just huge. The only glitch in the whole process is when I found myself unable to choose a seat after completing the booking, although theoretically my Economy Flex fare should have allowed me to do that. May have been a technical issue or maybe I overlooked some step. I completed the booking without choosing seats. In any case, when I checked in online I saw that I had automatically been assigned a seat by the emergency row. I do not know whether this was by design or not, but the seat thing turned out quite positively at the end, as the extra space is really welcome on a 4.5h flight on economy! 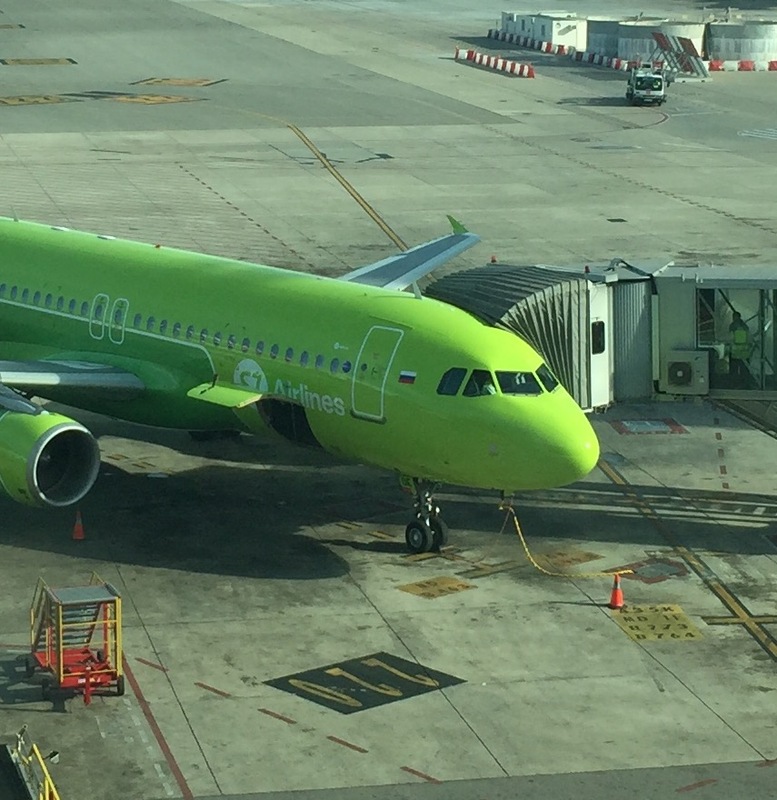 The overall tone and decoration of the cabin is aligned with this branding, as you would expect from an airline that paints its aircraft bright green and has the reputation of being an innovator in the Russian market. 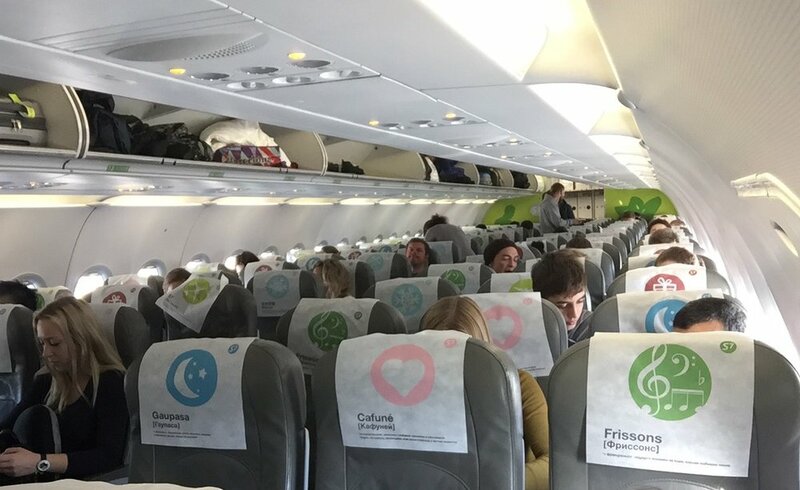 Light colours prevail, the corporate green is present at several places throughout the cabin and the colourful headrests protectors on top of the light grey leather seats add a much welcome touch of colour and fun. In fact, each of the headrests protectors is decorated with a creative motive and it contains a foreign word with the corresponding explanation. The explanatory text is in Russian, so those that do not know the language may miss the point (after all, most S7 passengers are Russian-speakers), but there is a bit of positiveness in each of them. For example, the one below refers to a Japanese word about how life can be beautiful in each of its manifestations. And this one about the S7 brand itself, about how it is difficult to explain the sense of happiness that you can get by flying on a green aircraft! Other elements inside the cabin are also painted the corporate light green, such as the walls at the front and back of the cabin (as you may have noticed on previous photos). Even the toilets are painted green! Although I had an emergency door seat and, therefore, my own experience does not count much when it comes to assessing S7's standard seats, my first impression is that even regular seats had a very decent pitch. This was confirmed by a quick search on SeatGuru. Comparing with its two main competitors on the Moscow-Barcelona route, S7's A320 30-33inch seat pitch is more on line with that of full service Aeroflot (30-32) than with more "similar" (when it comes to business model and marketing approach at least) Vueling (29). There was food service during the flight. First we got a drink, a choice of water (still and sparkling), juices and a pear-flavoured soft drink (pictured). Wine lovers may be a bit disappointed that no wine is served (or other alcohol drinks for this matter). Then, lunch, that was served in two "sets". A cardboard box - again showing the casual, fun, approach of the S7 brand - containing cutlery, napkins and the "side dish" part of the meal: turkey paté, two pieces of bread and dessert (gelatine with fruit and a chocolate snack of the well known Russian brand "Alyonka"). The "main" hot dish was served on a separate, heated, container. In this case the choice was between the typical dish of chicken and, as an alternative, a vegetable mix of grechka (гречка), a type of Russian buckwheat cereal, cooked together with mushrooms, carrots and other steamed vegetables. I opted for the later (pictured) and I must say, that, despite its rather bland aspect, it was quite tasty. Although not a vegetarian myself, I can see the benefits of offering at least one vegetarian option among the menu choices. On other airlines, unless you make a special dietary request, you may inevitably have to make a choice between two types of meat. The four and a half hours of the flight went by and we landed on a rainy evening at Domodedovo airport. During the flight, and besides reading on my Kindle, I had a brief look, as always, at the in-flight magazine, usually, the place to go if you want to know more about an airline. In this case S7, which is part of the Oneworld Alliance, has opted for a rather original presentation of its route map. Perhaps not geographically very accurate, but an efficient way to show its complex route structure, that spans two continents and two major hubs in Moscow and Novosibirsk (Siberia). Our Take: good value for money. If we look at the Moscow to Barcelona route, it would take a middle ground between the usually more expensive Aeroflot and the cheaper but more spartan Vueling. Aeroflot would still have a more complete business class, but in economy S7 covers all the bases quite efficiently. The overall tone of the S7 experience, including the digital sales process, and pricing structure resembles that of a low cost airline, but the inflight service is one step above.